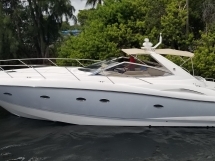 She is a classic example of a 2005 Sunseeker Portofino 46. She boasts an aft sun pad, a forward sun pad and a hydraulic swim platform for a tender. 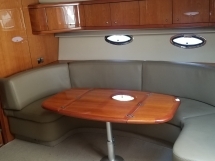 The helm and cockpit area will seat up to ten guests and features a wet bar with sink, refrigerator, ice maker and removable table. 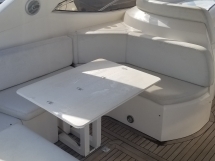 When entering below you will discover a nicely appointed galley to port, and to starboard a large salon area with a u-shaped dinette-sofa that will seat five comfortably. Aft is the guest stateroom featuring two single side by side berths, large hanging cedar locker and an en-suite head, as well as a flat screen tv and dvd player. Forward is the ample master stateroom featuring a raised queen berth with storage underneath, a large cedar lined hanging locker and an ensuite head, also featuring a flat screen tv and dvd player. She is powered by twin Volvo TAMD75EDC 480hp Diesels. 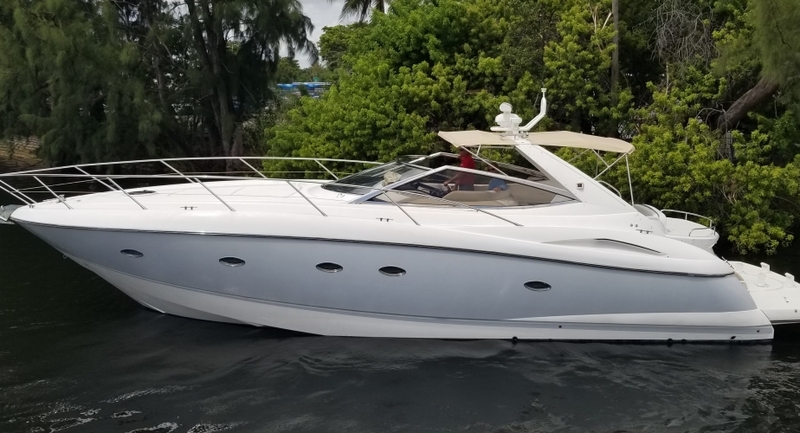 She features a Kohler Generator 7.5KW, Hydraulic swim platform for a tender, bow and stern thrusters with remote. She is ready for her next owner to cruise! A MUST SEE......Motivated Seller...Offers! !